Rev. John Whitehead, Rev. Louis A. Dole, and Walter A. Robinson are the founding fathers of the Fryeburg New Church Assembly. Rev. Dole (1885-1964) served as President of the organization for 21 years. Rev. Whitehead (1850-1930) worked closely with Rev. Dole and was on the lecture staff throughout the early years. 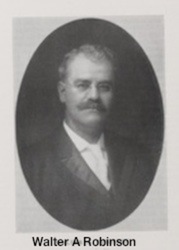 Mr. Robinson (1854-1925) was instrumental in promoting the idea of starting a "New England Summer School" as early as 1912, and underwrote the cost of the first year of the FNCA in 1921. In 1922, he was officially appointed Treasurer for the Assembly, at which time he had already been the treasurer of the Maine Association for many years.